Corals at a conference and coral frag swap, what great fun and an educational experience! Set in the beautiful northern country atmosphere of Rhinelander, Wisconsin with its moderate climate, green grass and pines, the 3rd Annual Coral Conference and Frag Swap was staged at the business complex of Doctors Foster and Smith.Presented by Doctors Foster and Smith and LiveAquaria.com Rhinelander, Wisconsin ~ June 29 - July 1, 2007. The atmosphere at the Coral Conference was casual and friendly. There were 70 coral frag traders and approximately 600 + attendees. Several industry representatives were present with booths displaying their latest in marine and reef aquarium products. Also included in the mix was the Marine Aquarium Societies of North America (MASNA), passing out calendars and promoting membership. People in t-shirts and jeans moved between warehouse facilities and outdoor-canopied areas enjoying frag swapping, auctions, and speakers. Attendees ranged from those just getting started in the hobby to advanced hobbyists. With speaker events both days and the diverse experiences of the many attendees, information was abundant. Folks had the opportunity to learn about the many aspects of reef keeping and coral propagation as well as exchange ideas and share experiences as they met fellow enthusiasts. 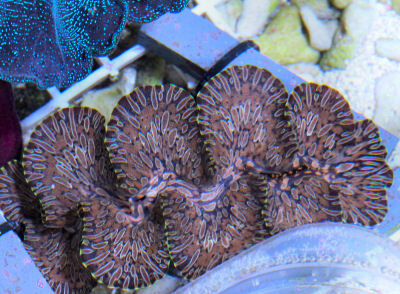 In just a few short hours many of the coral frags displayed by traders were bought or exchanged and some of the traders were even selling their now empty, small aquarium displays. Live auctions were held each day in the outdoor tented area and there was also a silent auction that culminated at the end of the conference on Sunday afternoon. The auctions were vigorous with many folks enthusiastically bidding on both corals and fish provided by LiveAquaria. Special events included presentations by 6 expert marine enthusiasts, short tours of the Doctors Foster and Smith aquaculture facility and warehouse, a special kids enrichment area, and a book signing with Scott Michael and Julian Sprung. Saturday's activities culminated in a dinner banquet held at the local Holiday Inn featuring Scott Michael as the keynote speaker. Though you may not know Scott Michael personally, reading one of his books will quickly give you the flavor of his congenial and friendly personality. He is also quite funny. As the featured banquet speaker his humor along with his genuine interest in sharing the world of saltwater critters with his audience quickly had everyone comfortable but attentive. Scott formatted his presentation with a list of 20 "undeniable truths". They ranged from the crazy and hilarious to the incredible. Each was complimented with slides and videos of some fabulous species, many that are excellent for the reef aquarium. Interspersed throughout were some goofy 'truths', like "frogs can't live in a marine aquarium" and "Julian looks sexier without hair". These kept the crowd smiling while more profound ‘truths' such as "the marine aquarium hobby impacts the reef" and "some fish and corals are best left on the reef" inspired our sense of responsibility. The speakers were all top notch with presentations covering many of the aspects involved in keeping reef aquariums. The topics included nano to large reef setups, reef inhabitants, and coral propagation. There was also an overview of the history of aquarium and reef keeping as well as an introduction on how to develop a coral propagation business. Now here's a fellow that knows his nano reefs! Not only has Julian Sprung written many articles and books, notably "The Reef Aquarium, Vols. 1, 2, & 3", he is also the co-founder of Two Little Fishes, Inc. and is an expert at reef keeping. Julian shared his life long experiences with a wide variety of nano reefs. He has kept everything from individual species jars to the more standard 10 and 15 gallon aquariums. It became apparent during his talk that Julian sees and is fascinated by the little things, the micro life that he finds in the marine world. As he discussed these various life forms, I found myself likening him to artist Georgia O'Keefe who said "Nobody sees a flower – really – it is so small it takes time – we haven't the time…" As Ms. O'Keefe shared the miniscual beauty of her world through art, so Julian explores and shares the beauty of the small things living in our vast oceans. Julian's presentation also covered the myriad types of equipment used to keep a nano reef, including what has been available in the past, what is currently available, and what is on the horizon. An excellent introduction to the world of nano reef keeping! To get a feel for the other side of the equation, large reef aquariums, a visit to the aquaculture facility was in order. A tour with Steve Krogh, assistant director of the facility, gave us a wonderful and educational experience. Being a dedicated aquarist since he was 12 and having propagated corals for 13 plus years, Steve's enthusiasm was highly contagious. The aquaculture facility is state of the art with 20,000 gallons of water in 8 independent systems. It encompasses large versions of the water filtration and lighting components that you would find in a sophisticated modern home reef aquarium. To insure healthy livestock for their retail customers the facility has some extras, too. These included a separate receiving area, a separate quarantine/medication area, a fluidized sand bed filter for the large polyp stony corals (LPS), clams and other organisims that need a more nutrient rich environment, and UV sterilization. "Setting up Large Reef Aquaria." Installing a large reef aquarium in the home can be quite an undertaking. Dr. Sanjay Joshi, professor of industrial and manufacturing engineering at Penn State University and an experienced reef enthusiast, shared how he put his expertise to work. He not only co-manages the university's 500-gallon reef, but also keeps several reef aquariums in his home. In a thoroughly enjoyable presentation he shared the experience of installing a very large, 900 lb glass reef aquarium in his home. Dr. Joshi used slides to visually walk us step by step through the entire process. The easy parts were moving a wall, installing dedicated electrical outlets, building a stand, and installing the plumbing. The tough part was getting that monster delivered and in place without breaking it! Throughout the presentation Dr. Joshi pointed out the importance of planning. In what he called ‘Defense Design", he laid out key design principles. They included drawing out your system so that you can find and correcting potential problems, provide safe guards with independent sub-systems, but most importantly avoid unnecessary complexity. At the conclusion I think everybody felt they had the tools to install their own reef, no matter what the size. For attendees to better understand and maintain the water quality of their own systems, speaker Dr. Timothy A. Havanec discussed the chemistry in marine aquarium water. To better understand and maintain the water quality of their own systems, speaker Dr. Timothy A. Havanec discussed the chemistry in marine aquarium water. An expert in water quality, microbiology, and aquarium filtration design, his presentation gave a quick overview of the synthetic sea salts available to hobbyists and how its composition compares to natural sea water. The main emphasis of Dr. Hovanec's talk was on maintaining the proper levels of calcium and magnesium in the water. He discussed when and how to test for them, along with how to adjust them by using additives such as kalkwasser (lime water) and calcium reactors. The formal presentation took about 20 minutes and the remaining time was spent individually, with each person taking turns to ask a question about their specific aquarium. Though it could have been a technical and dry topic, Dr Hovanec provided a very interactive and useful experience for all. Perhaps the most exciting part of the aquaculture facility was seeing all the wonderful coral and invertebrate species that are being propagated there. It was like walking through a fairyland! We humans have a strong curiousity about our natural environment. A perspective of our curious tendencies was explored by Gary Jones of Aquarium Pharmaceuticals, Inc. who presented us with a wonderful overview of the history of aquarium and reef keeping. It was quite surprising to learn that the keeping of aquatic animals started over 400 years ago, possibly as early as 1572 but definitely in the 1600's with China exporting ornamentals.Though there are historical references to several individuals keeping various species such as anemones and stony corals in the early 1800's, Naturalist William E. Damon is actually credited with being the first saltwater aquarist in 1879. Throughout its history the aquatic hobby was stimulated by many exciting public exhibits, species collection expeditions, and even in literature such as Jules Verne's "20000 Leagues under the Sea" (1875). Gary went on to discuss the introduction of various specialized equipment that we take for granted today, culminating his talk with a projection of potential future advancements such as LED's and other lighting that is just beginning to be looked at. The conference was a family affair providing young enthusiasts with a special ‘Kid's Area' that provided many activities for youngsters. The most fun was touching a variety of starfish, snails, and other critters. Kids got to play some ‘fishy' games on a computer and get special treats and prizes too! With an eye to the future, Ike Eigenbrode, vice president of marketing at Current USA, discussed the ins and outs of setting up a coral propagation business. Ike has an extensive background in aquaculture system design and water quality monitoring, and he maintains a personal coral propagation system. Ike first discussed what it takes to develop a successful propagation system from a business standpoint. Included were such things as developing a business plan, studying and knowing your market, and also some suggestions on how to get business and finacial help. He then described system designs for both outdoor and indoor propagation, including the wide array of necessary equipment needed for water quality and lighting. He offered many great suggestions, encouraging people to think outside the norm by exploring alternative types of setups. One of my favorites was the use of such things as fiberglass boxes, kid's preformed swimming pools, and hydroponics containers for the 'aquariums'. Ike is quite thorough, but he is also efficient and creative! With all the excitement and activities, a good time was had by everybody. Everyone's natural curiosity was peaked at every turn. A big thank you to Doctors Foster and Smith and LiveAquaria.com for devoting their time andeffort into bringing like minded peopletogether in a sharing environment, for providing the best in current education andresources, and especially for their dedication to "take pressure off of the natural reefs". The 3rd Annual Coral Conference and Frag Swap was a great success!